. :[ git me! ] :. @dmz Can I have your colors? I cant find than in your git repo. I want all the 256, looks like you modified than too, I'm trying to choose good substitutes for the 6x6x6 color cube, already modified my urxvt to accept >15 xresources, but I cant get good 216 colors. that might help you generate colorschemes with all of them 256 colors. 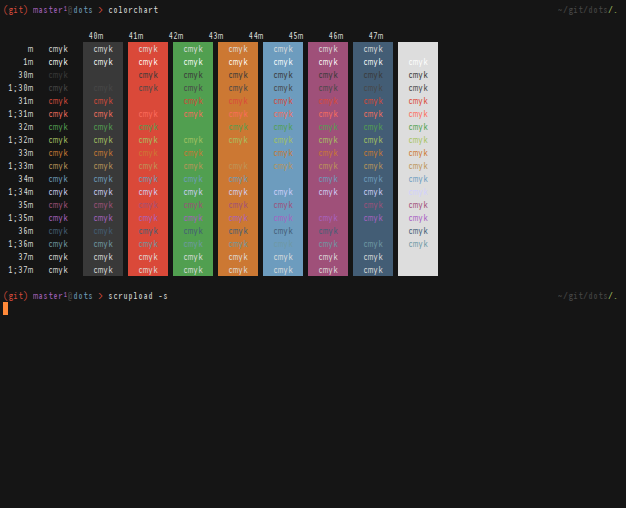 Based on the Railscasts Textmate theme. Sorry, i saw some full-size pictures in the previous page and i thought it didn't matter, because of the small size (11k). However, fixed! Maybe it's a default one i found somewhere, however i enjoy it. Decided I wanted all my colours to be shorthand format because I'm lazy.
! -- Colours -- ! if you still have questions, don't be afraid to ask. Slightly modified version of thayer's configuration, also enough to kill someone's eyes.